A few weeks ago I used up all my compost. I had two full Earth Machines and one pile overflowing its chicken wire container. 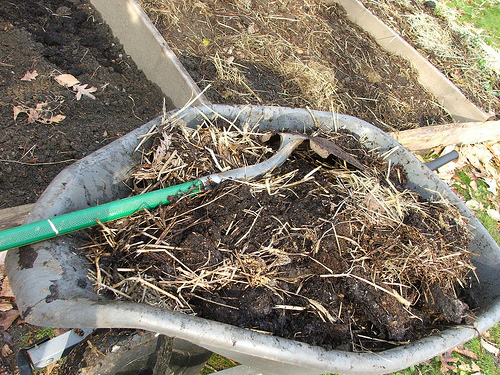 Not all of this compost was done yet, but after mixing it all up and adding straw, it was just the right mix of finished and unfinished for my purposes: mulching the unused beds for winter. at the bottom a ten inch band of dark, fluffy soil at 65 F.
a fat middle layer of compost still at it at a steamy 120 F.
at the top another ten inch layer of slushy, browning organic matter, much of it still recognizable, at 80 F.
75 degrees is the perfect temperature for vermiculture, and for sure, this top layer was riddled with thousands upon thousands of Red Wigglers (Eisenia fetida). 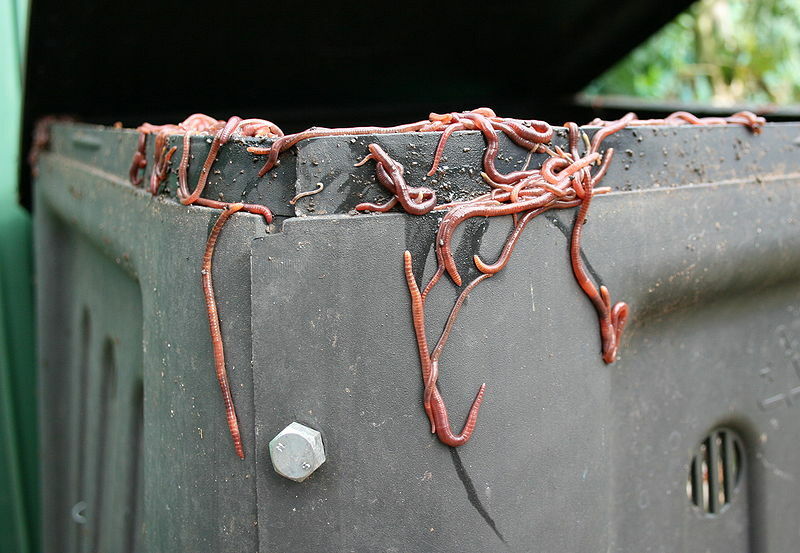 These worms do not live in soil and many people have to buy them by the pound. I did not buy mine and I have no idea how they got to be there, but they are welcome. The bottom layer was being consumed by psychrophiles – both bacteria and fungi, which latter never like it hot. The middle layer was colonized by thermophilic (heat-loving) bacteria. The top layer was being consumed by psychrophilic and mesophilic bacteria and fungi, as well as some flies, some larger invertebrates, and mostly the worms. All these organisms break the pile down into carbon dioxide, water and humus by using the nitrogen (N, greens, protein) in it to consume the carbon (C, browns, carbohydrates). I always imagine this process as an angry mob of angry villagers setting fire to the wooden house. Only they set the fire inside their guts. A mouthful of carbon, a nibble of nitrogen (with an average C:N ratio of 30:1) and whoosh! The same happens when the larger organisms eat the smaller ones. It is their body heat – the oxidation of the carbon – that the compost thermometer registers. The heat-lovers, burning the hottest and being the most numerous, consume the fastest. The Wigglers, who don’t like it above 80 F, take their time. I was sad to have to break up this veritable worm bin. Some of them ended up in the beds and others I transferred to the new (uninsulated) bin, which will collect our kitchen scraps over the Winter and Spring. None of them will survive the cold temperatures, since unlike the earthworms they cannot migrate deep down into the ground when the surface starts freezing up. I hope they will as miraculously show up in my compost next year.